I began writing at fourteen but when I started my family at nineteen, I think that the sterilizer vaporized my creativity. I figured that it had boiled away with the germs on the baby’s bottles. Occasionally, I’d have a poetic burst, but by the time I was twenty-six, I had three children screaming for my attention and my writing ceased. I told everyone that I was a writer, but my kids kept me too busy to write. “When the kids grow up,” I’d say. When the kids finally went off to school, “prove it” anxiety set in. I thought about having another baby, but that seemed rather desperate. I had to face facts. It was time to write. I began slowly, but regained my confidence as the words poured from me. Poems began to accumulate and I’d read them to friends and family. In 1988 I bought an electric typewriter and started to organize my work. I also took my first college class. I enrolled full time, but the schedule overwhelmed me. After one week, I’d dropped all the classes except for one, Country Song Writing. Many of the students were my age, which was encouraging. I continued to write, even bought a computer, but I often let kids, grand-babies and housework come before my writing. Then in 1994, a drunk driver killed my son-in-law, Donnie. He kissed his wife and his tiny son good-bye that morning and less than ten minutes later, he was dead. His sudden death caused me to reevaluate my life and to focus on what mattered most. I found out that it wasn’t clean sheets or dustless floors, not even baking delicious desserts or cooking big meals. Again, I enrolled full-time in college. This time I stuck to the plan. My husband was supportive and he took over some of the household chores. Some, I just ignored. I decided to treat college like the ocean. The only way to go in the icy cold waves is to close your eyes and to run into the surf as fast as you can. Once you make it past the undertow, the waves are breaking in front of you, not sneaking up from behind and the water feels warmer as your body temperature adjusts. The gentle swell rocks you as you swim and the blue-green horizon stretches out as far as you can see. I enjoyed learning in spite of the tremendous workload. I usually stayed up past midnight doing homework for Comp. I, memorizing outdated laws for Criminal Justice, (don’t even ask me how I landed there) or cramming my head with strange definitions for Biological Psychology and then I’d get up at 5:00 a.m. to study for a test or to finish an essay. The changes in my priorities did upset my fifteen-year-old son (my youngest child) especially since I’d stopped cleaning his room and I’d begun to consider heating a frozen pizza cooking supper. One night, he told me that I was too old to go to college. I laughed at him. He asked why I couldn’t wait to go to college, at least until he was grown-up. I said, “I’ve already wasted twenty years cleaning closets and vacuuming under the furniture. By the way, you need to do a load of laundry if you want clean jeans for school tomorrow.” As he shook his head and walked away, I smiled. After five years of working as a sports journalist/photographer, I decided to leave that job and I reevaluated my writing goals. I’m not afraid because I know I’ll find another niche where my words fit and I know that the answer for me is to just sit down and let the creativity I’ve been blessed with guide me. It also helps to know that the only way I can lose my status as a writer is if I stop writing. P.S. My kids did grow up, faster than I ever dreamed possible and I now have fifteen grand-kids, ages 28 to 3. I have also been blessed with five great grand-babies. The grand-kids are growing up even faster than the kids. 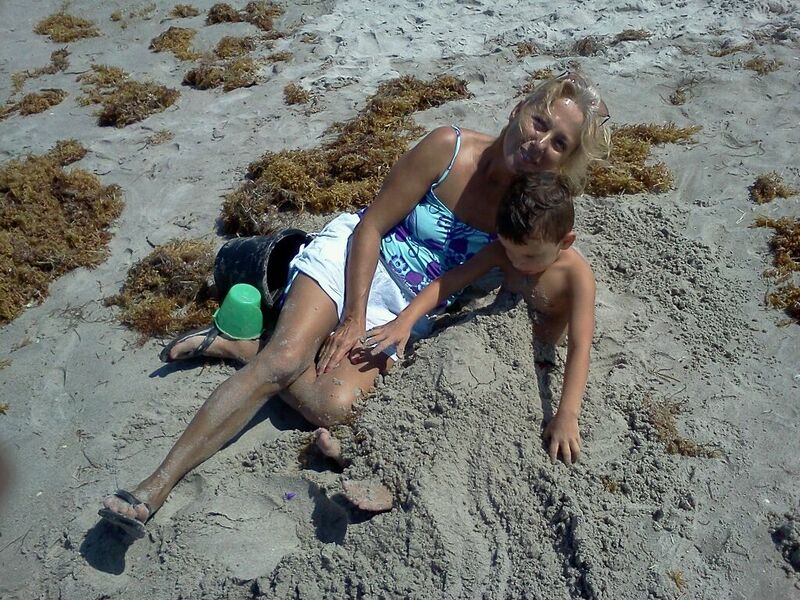 The picture above is grand-baby #13, Jonas, playing with me at the beach. You look amazing. Good on you for keeping going. Thank you but that pic is from ten years ago! I now have 14 grandkids and four great grandbabies! So true, funny, and inspiring!!! Your words made me think: I have often found the act of writing to be a calm oasis within moments of chaos. Ironically, my writing often created chaos within the peaceful order of my life. Even more ironic, is discovering through my writing that the peaceful order had been an illusion. Lesson learned. Write…. just write, now. Breathe… just breathe, later. Thank you! No, thank you. Your words always inspire me. When the.., is a common theme in everyone’s life and sadly it usually takes an eye opener like your son in laws death to push us into that when is now state. I’m happy you did get to write and enjoyed your book. You really have talent! Thank you, appreciate your encouragement. I don’t have any kids, so I can write, paint, photograph stuff…do whatever I want basically. However, I have got three cats and they can be very demanding at times. My Chihuahua lays beside me the entire time I’m on the computer. Outside of that, she harasses us for treats all day.